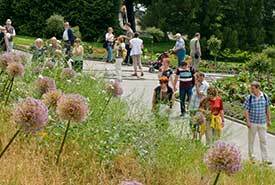 ABOVE: A walk through the "Dahlia Hill" section of Mainau's gardens in early June. Mainau, nicknamed "The Flower Island," is the most popular tourist attraction on Lake Constance (a.k.a. the Bodensee). The small island, which is about 5 km or 3 miles from the city of Konstanz, has a semitropical climate that inspired Prince Nikolaus von Esterházy to create a botanical garden in the first half of the 19th Century. Later, under Grand Duke Friedrich I, the gardens were expanded with an arboretum, an Italian rose garden, and other features that visitors enjoy today. In the 1930, Prince Wilhelm (then the island's owner) turned the administration of Mainau over to his son, the Swedish Prince Lennart Bernadotte II. The prince, who had renounced his Swedish royal lineage after marrying a commoner, devoted the rest of his life to turning the island into a privately-operated park. Mainau is now maintained in perpetuity by a foundation that the prince and his second wife established, and the island's manager is their daughter, Countess Bettina Bernadotte. Their son, Count Björn Bernadotte, manages the foundation. Mainau's 45 hectares or 111 acres of gardens and landscaped grounds attract more than a million visitors each year. In addition to flower gardens, Mainau has an arboretum, a butterfly house, a gallery with special exhibitions, an area for children, a castle, a baroque chapel, and a variety of restaurants. Allow a minimum of several hours for a visit, and plan on spending the entire day on Mainau if you're seriously interested in gardens.